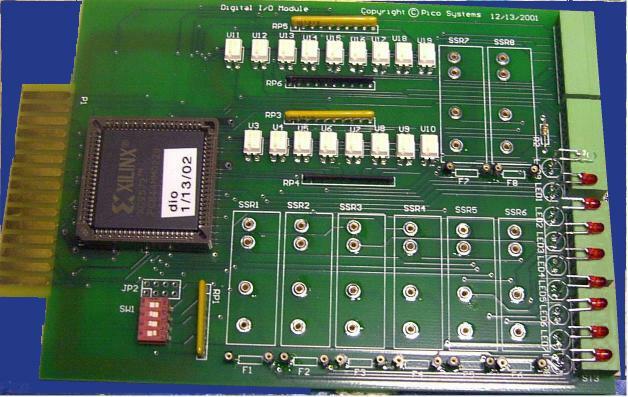 This board contains 16 opto-isolated digital inputs for limit and home switches, etc. It also has places to mount 8 Omron Solid State Relays. One additional opto-isolated input is provided for an Emergency-Stop current loop. Control is through a bi-directional parallel port, with signals connected via the PPMC motherboard. The board has a 4-position DIP switch to set the range of addresses the board responds to. It occupies a block of 16 Byte addresses. This allows more than one DIO board to be used in a system, to obtain more input or output channels.